I’d love to tell you want it all meant, but instead I’ll just share a partial [but unranked] list of the books I read this year. Do well and be well in 2019. Educated at home, the young Émilie learned to speak six languages by the time she was twelve, and had lessons in fencing and other sports. Even from a young age she was fascinated most by science and math, much to her mother’s displeasure. Such interests were not viewed as proper for young ladies, and her mother even threatened to send her away to a convent. Fortunately, her father recognized her intelligence and encouraged her interests, arranging for her to discuss astronomy with prominent scientists he knew. Émilie also had a flair for gambling, applying her talent at mathematics to give herself an advantage. She used her winnings to buy books and laboratory equipment for her scientific investigations. When she reached age 18, she knew she had to get married, and she accepted the proposal of Marquis Florent-Claude du Châtelet, a distinguished army officer. This was a convenient arrangement for Émilie, because Châtelet was often away from home, leaving her free to indulge her interests in studying math and science on her own. She was also free to carry on an affair with the writer Voltaire, one of the few men who appreciated her intelligence and encouraged her scientific pursuits. Émilie du Châtelet and Voltaire renovated Châtelet’s large estate house in the countryside. The house included several rooms for scientific equipment and space for experiments, and a large library holding over 20,000 books, more than many universities at the time. Although she was frustrated at being excluded from scientific society and education because she was a woman, she was able to learn mathematics and science from several renowned scholars, including Pierre-Louis Maupertuis and Samuel Konig, by inviting them to her house. In 1737, after several months of conducting research in secret, she entered a contest sponsored by the French Academy of Sciences on the nature of light, heat and fire, submitting her paper Dissertation sur la nature et la propagation du feu. In it she suggested that different colors of light carried different heating power and anticipated the existence of what is now known as infrared radiation. She did not win the contest, but her paper was published and was positively received by the scientific community. She also developed a strong interest in the work of Isaac Newton, which was somewhat controversial at the time in France, where Cartesian philosophy was favored over Newton’s ideas. Émilie and Voltaire jointly wrote a book, Elements of Newton’s Philosophy, which explained Newton’s astronomy and optics in a clear manner for a wide French readership. Only Voltaire’s name appeared on the book, but he acknowledged her important role. Émilie also worked on another manuscript, Foundations of Physics, in which she considered the philosophical basis of science and tried to integrate the conflicting Newtonian, Cartesian, and Leibnizian views. One of her most important contributions to science was her elucidation of the concepts of energy and energy conservation. Following experiments done earlier by Willem ‘s Gravesande, she dropped heavy lead balls into a bed of clay. She showed that the balls that hit the clay with twice the velocity penetrated four times as deep into the clay; those with three times the velocity reached a depth nine times greater. This suggested that energy is proportional to mv2, not mv, as Newton had suggested. While conducting her scientific work, Émilie du Châtelet still carried out her duties as a mother to her three children and as a hostess for her many visitors so she was always busy, and had little time for sleep. 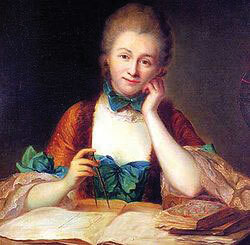 At age 42 Émilie du Châtelet discovered she was pregnant. At that time, a pregnancy at such an old age was extremely dangerous. Knowing she would likely die, she began working 18 hours a day to complete her biggest project, a French translation of Newton’s Principia, before she died. For many years, hers was the only translation of Newton’s Principia into French, amazing considering the context and just goes to show how obtuse we can be, even at the heights of civilization. Do we develop metaphors to describe things/phenomena/feelings/people that otherwise elude description? It seems so. But do we then turn the metaphors back onto actual situations again? Less clear, but promising. His only adaptation of a book from his favorite writer, Fyodor Dostoyevsky, Akira Kurasawa’s “The Idiot” turns the film into a larger metaphor for Postwar Japan, a nation traumatized, ashamed, destroyed and suffering a severe identity crisis. It also has a what-could-have been awfulness: the director originally intended the film to be nearly five hours long, and in two parts, but his backers, Shochiku, cut it to shreds, ending up a little shy of three hours. No other work has been a better companion to Dostoyevsky’s unrelenting view of humanity than Akira Kurosawa’s much-maligned 1951 film Hakuchi. The original cut stood at 265 minutes, trimmed to 166 minutes by studio executives at Shochiku against the director’s wishes. “In that case, better to have it cut lengthwise,” he is said to have responded. Nobody knows what was left on the cutting room floor as Kurosawa was unable to locate the lost footage, leaving it impossible for audiences to follow the narrative of the film. 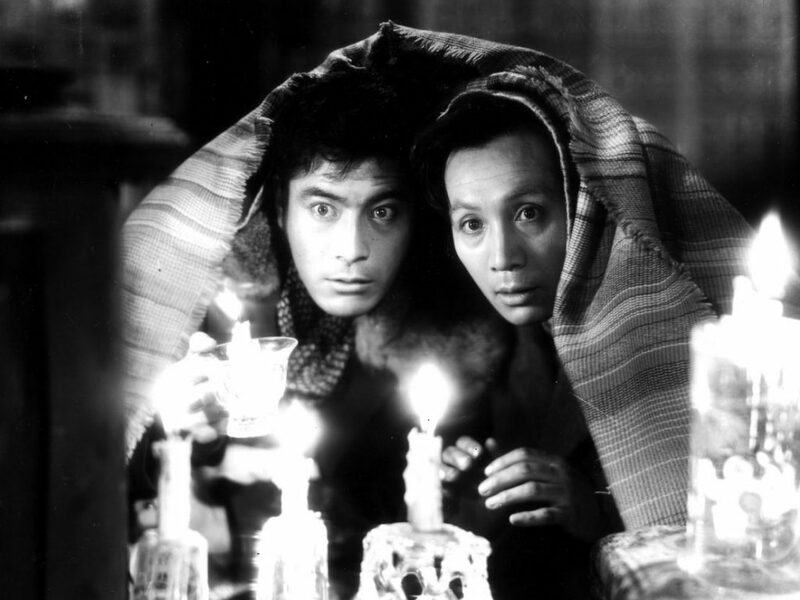 Hakuchi was critically derided upon its initial release, finding only a handful of fans in Russia – among them Andrei Tarkovsky. Hakuchi must have been a very special project to Kurosawa. It is one of his most important early works, and he refused to stray from a wholly faithful adaptation to the book unlike later on with his liberal interpretations of Shakespeare in Throne of Blood and Ran. And despite its obvious failings in narrative flow, no other Kurosawa film tells us more about Japan at the time or conveys as much intense emotional power as Hakuchi. 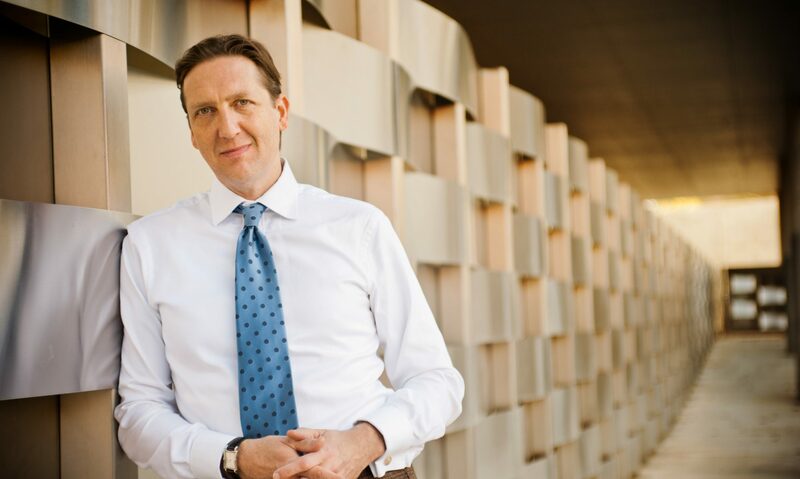 His decision to transport the novel’s events from the glittering St Petersburg to wintry Sapporo on the northernmost island in Japan, is not a purely aesthetic one. Perhaps a more obvious choice would have been Tokyo or Osaka, cities which are closer similar in spirit to St Petersburg. But then we would have been denied that remarkable scene at the beginning of the film. The thuggish merchant Akama (Rogozhin in the book, played by Kurosawa stalwart Toshiro Mifune) and Kameda (Masayuki Mori as Myshkin) stop before a portrait of the woman they will both destroy each other for, her gaze lit up by the blizzard. All around them, peasants struggle by with their carts and goods in the bitter cold. The darkness, both literal and metaphorical, is almost complete save for the faint falling snow, which makes the men’s faces flicker in the shop window. How difficult it is, Kurosawa seems to be saying, to bring light to a place where it is perpetually night. An old stereotype valorises the purity of the “traditional way of life” in Japan, outside of the moral corruption of the big cities. This is epitomised in many classic novels including Yasunari Kawabata’s ‘The Old Capital’ from 1962. But Kurosawa situates the showy greed and lust of The Idiot in the heart of Japan’s rural outposts, turning this assumption on its head. There is no foreign malice come to take away the innocence of the people; they have nobody to blame but themselves. Fittingly, although the film is set in post-war Japan, the endless snow negates all reference to the time period. The struggle to do good in the world and to eke out a redemptive humanity requires no specific cultural context. I have a deep reverence for The Idiot (as well as Poor Folk), and its rendering into a different medium brings up some good questions about the utility of metaphors themselves. Refracted cultural explanations of real life that slap back onto actual things; this is [one of the reasons] why, as soon as I heard about it, I couldn’t wait for Postmodernism to be over. The great societies that produced the great novels of the past have cracked…. The novel as a form no longer carries conviction…. The novelist, like the painter, no longer recognizes his interpretative function; he seeks to go beyond it; and his audience diminishes. And so the world we inhabit, which is always new, goes by unexamined, made ordinary by the camera, unmeditated on. Just go read it all. It’s Friday – what else are you doing? Plus you’ll be relieved of thinking about vulgarians for a while better for it. 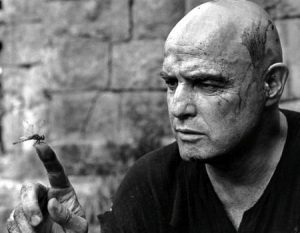 Image: Marlon Brando as Colonel Kurtz. 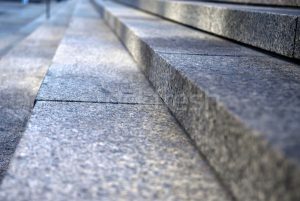 A young* man in dark slacks, white shoes, a blue button down shirt and vest walked up the steps of a library. A grand edifice equal to its holdings, the building featured a trio of main entrances and the man entered, knowingly, the one on the right with an automatic door. Past security to the bank of elevators, he waited only momentarily for the doors to open, close and transport him quickly up to the third floor. He found the PQ’s and three rows in walked all the way down the aisle, almost to the very end. He arrived at the section and began reading titles. After a minute so poised, reading the spines as if making a selection beyond a single book he had come for, he pulled out one book, opened it, perused, but then replaced it. He took out another and put it back without opening. Then spying another on a higher shelf, he took down the book, opened it to the verso and just before letting out a startling loud sneeze, lofted the book high in one hand to avoid splattering it with the involuntary spray. Involuntary, but not invisible. Because when quiet down the row resealed itself and he looked around and saw no one, the man spied the bit of phlegm he had caught in the other hand that covered his mouth, just as involuntarily. Now quite deliberately attempting to safeguard the books from the one soiled hand, he continued his quest for a few more minutes. When he had finally decided on a selection, the man took the book back down the long aisle. Before turning into the bank of stairs as though he studiously and by habit avoided the elevator on the way down, he turned into the men’s room just opposite the first shelf of PR’s. Inside the empty lavatory, he shifted the book to hold it under the armpit of the left, soiled hand, while he turned on the cold water with his right. The handle was easy to turn, perhaps, easier than expected, and just as the water fired against the basin, the book came loose from the pit, as he leaned over the sink to clean his hand. Into the full spray and quickly filling basin it fell, splayed open at page 139. He grabbed the book quickly, though damage had been done. He finished cleaning the hand and went downstairs to circulation. “Can I help you?” the kind young woman asked. “I….” and he proceeded to explain what had happened. She frowned, but not in the way he might have expected. “What book is it?” she asked. “Oh, it’s a novel by Jean Genet. It might actually have been a play…” he was saying but she shook her head. “OH. Don’t worry about. No one reads that book,” she said. “I came here for it, to get it,” he said, as though he stood for legions. “It’s not even in English,” she assured, of which there was no need. “How does that matter?” he asked but exasperation began to appear on the woman’s pleasant face. She seemed so understanding. Too understanding, such that her understanding seemed worth nothing at all. “it’s a him,” she pointed out and now the young man began to appear exasperated. “Was,” she corrected him. The man sighed, handed over the book and felt a sneeze coming on.